Milwaukee police say a house fire on the city’s northside that killed two people was deliberately set. 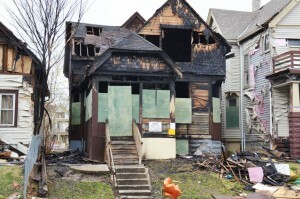 On Friday, April 18, 2015 around 3:00 a.m., Milwaukee fire crews responded to the house fire near 38th and Wright Street, which spread to the adjacent homes. Oxygen tanks inside the house were reported exploding as fire crews arrived, which made the fire more difficult to combat. After the fire was brought under control, two bodies were found on the premises. One of the victims was identified as Dontray Jones, a 17 – year-old male, while the other body was identified as an adult female. The Milwaukee Police Department worked alongside federal agents and personnel from the state fire marshal’s office to determine the fire was arson. While several individuals have been brought in for questioning, there have been no arrests and the investigation is still ongoing.